Coming in at #9 we have one of my very favorite loons, the lovely Michele Bachmann. Bachmann is the United States Representative of Minnesota's 6th congressional district and a member of the Republican Party. Judging by a number of trustworthy sources and good evidence (mostly the words that come out of her mouth), she may be the single stupidest person alive (perhaps in competition with Steve King, R-Iowa). Staunch supporter of the teabagging party (including all of their contradictory goals, apparently). Good mental compartmentalizer, for she is apparently completely unaffected by (or aware of) cognitive dissonance. Diagnosis: Complete moron – a living embodiment of Dunning-Kruger. Obviously in possession of power and influence, and probably a large fan group as well; in other words very dangerous. Wait, she cant be more stupider...is that a word?....ok, more stupid...than my girl Sarah....can she? Sarah's up there, but my money is still on Michele. Speaking as a wingnut, my problem with Michele Bachmann is that she's accepted leftist dogma that history always moves left. For example, she thinks the top rate of income taxes was lower in the 1950s than today. It wasn't. Anyone up for more falsehoods from Bachmann? Her husband isn't entirely well-hinged either, it seems. This one is also rather appalling. And here she claims that Terri Schiavo was healthy. At last she's also claimed that hurricane Irene was God's warning to America. ... and just to fill out the picture, she's finally accepted anti-vaxx rhetoric as well, falling for simplest, most easily refutable talking points from the most insane conspiracy theory-laden antivaxx groups. Given the recent noise around Bachmann and HPV, this one deserves a link. Even though she’s obviously lost steam it’s kinda fun to keep track of her campaign. Here’s her claim that the US should follow China and drop the welfare state to boost the economy (the bizarreness of which is rather astounding). Indeed, she’s been making several, uh, interesting foreign policy suggestions lately. There’s a good Bachmann resource here. And it never stops, even though you thought the last one was unbeatable. Here's the latest Bachmann endorsement of creationist and all the creationist talking points. Here's an illuminating interview with Bachmann on Biblical worldviews, public schools and a general lack of touch with anything resembling reality. And Bachmann explaining how she wishes to reform the courts to conform to her Biblical view of law. Charming. Bachmann is not willing to give up. Not only has she threatened to leave Minnesota if the recent decisions on gay marriage didn't go her way (I don't think the majority of Minnesotans would miss her); she is also calling upon spiritual warfare to enforce rightwing policies, which, if it worked, has to be counted as some kind of terrorism, wouldn't it? Well, I suppose one should interpret her in light of 9/11 and Benghazi (which in lots of wingnut minds are apparently equivalent) were God's judgments. Putting those two things together portrays a rather interesting picture of her. Finally, Bachmann has announced that she will not be running for office again. She lies about why, of course, but the most important thing is that she won't. A list of Bachmann's 5 most significant predictions. (Some of) the best of Bachmann. 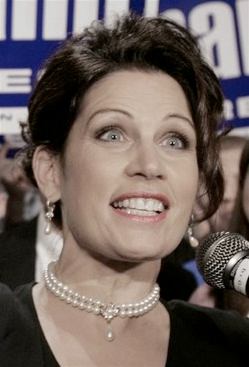 Though she's on the way out, Bachmann doesn't pass the opportunity to spill a few more nuggets of insanity. Here she tries to argue that the Supreme Court's recent marriage equality ruling is an attack on equal rights, and here she apparently tries to outcrazy Gohmert on the issue. I would be hesitant to claim that Bachmann has grown even crazier, but there are things that suggest ... well, at least she hasn't grown less crazy. Her attempts to argue that Obama has committed "impeachable offenses" are stock fare, as is (I think) her delusional rants about how Obama has rewritten the Constitution for himself (whatever that means). Bachman was the only candidate in either party who understood immigration. she remarked we used to have an immigration policy that worked before the 1965 Immigration Act. Immigration is simple-who comes-how many come- and what will be the laws to enforce our first two choices. Currently we have an immigration system that rewards open border billionaire globalists who then pass on all the social, economic and environmental costs to the communities. Also, the consequences of immigration are irreversible. Bachman deserves some credit on immigration. Bachmann has left Congress after 8 years of supplying the American people with unintentional lulz. Her last claim before leaving office was taking credit for the lower price of gas. Which, of course, the Wingnut bloggers are taking seriously.